Ok, so I’m overusing the title “Quickest Meal Ever”. There can only be one “Quickest Meal”, right? In our bizarre blog world, no. I’ll have as many “Quickest Meal Ever” posts as I want! You know why? Cause they’re quick and we all know you like some things to happen quickly – getting a shot at the doctors, ripping a band-aid off a hairy arm, getting a bikini wax and making meals. For fu*ks sake, that’s why that idiot Rachel Ray is popular – she’s got every one of you fooled that her meals only take 30 minutes to make! Well, if you’re as lucky as she is to get every one of your veggies and meats completely prepped and cleaned for you, you may have a chance of making it under 30 minutes. Rachel aside, the recipes I label “Quickest Meal Ever” must only take about 30-40 minutes to make from start to finish. And I actually cut things up and prepare things if necessary. 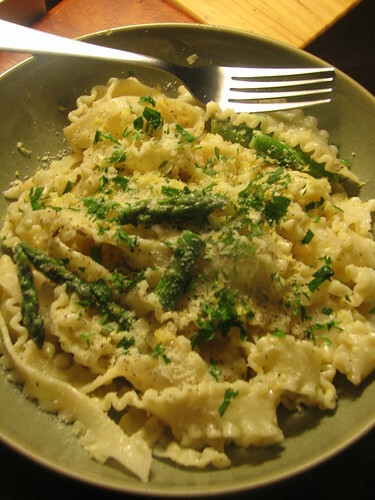 So with that I invite you to make this delicious and light Creamy Lemon Pasta. Yes, there is cream and some butter mixed in, but it really tastes so incredibly light. Even though we’re in the midst of winter, eating this meal tonight made me imagine that summer is on the way (unfortunately, it was only the food coma talking). Saute shallot and onion in 1 tablespoon butter. Add some olive oil if it needs extra stuff to saute in. Once shallots are translucent, add chicken stock and the juice of one lemon. Allow to reduce so only 1/4 of the stock remains in the pan. Cook pasta in boiling, salted water. Once stock is reduced, whisk in the heavy cream. Add a pinch of salt, the lemon zest and the juice of the other half of lemon. Whisk in the last tablespoon of butter and about 1/8 cup of the pasta cooking water. Allow to cook on medium and reduce a bit. It should be bubbling while it reduces and thickens. Add they drained pasta to the lemon sauce and toss with parmigiano reggiano, the blanched asparagus (optional) and some fresh pepper. Top with a sprinkle of parsley, some extra lemon zest and another small bit of cheese and voila! every time i cme to your site, i drool over your banner of meats! plus i’ve been stalking the frito misto. now look at this pasta sounds delicious, creamy and lemony, wow! Thanks, girl!! I even still drool when I look at the meats… i’m drooling now in fact thinking about it! Thanks for the nice compliment! Your awesome photography make me want to jump into your pics and eat! Last week those mussels – I was so depressed to be in cold, wintery NYC while you were enjoying a cold beer and some summer mussels! Thanks, Aria! I just got some meyer lemons from the market and this will be one of the dishes I make with them. thanks for the inspiration. How many people does this recipe serve? is this a serving for 1? @Natalie: that largely depends on your appetite! But, it’s based on two moderately hungry adults. Please publish your recipes with dry goods measured by weight as well by volume. This will more than double your potential audience: Europeans weigh anything that’s not liquid. Even if the British were used to using “cups”, your measures are useless to us: Imperial cups are larger than US ones. As you may know, there are 2 cups to a US pound, meaning each cup is 8oz in weight or 1/2 pint in volume each. A quarter cup therefore is 2oz, roughly the same as 4 US tablespoons. Since tablespoon is synonymous with dessert spoon in the US, but a UK tablespoon is considerably larger, you’ll need to adjust accordingly. Not so easy, eh?